Gio was great! She communicated with us well before the tour to make sure we knew where to meet, if we needed anything, etc. she arrived early and guided us quickly into the museum. She was great at maneuvering us thru the crowds to get a good view of what it was she was explaining. We were 3 couples with not much knowledge of the art or history of the area. Gio did a fantastic job of explaining what we were seeing, giving us historical context while also making it interesting! Highly recommend! TOUR GUIDE RESPONSE: Thank you for your kindness Susan, I had a great time with you! Hope to meet you again here in Florence! Giovanna was a wonderful tour guide. She provided a walking tour of Florence for us hitting the artistic, political, and architectural highlights. Her passion for Florence came through loud and clear! Highly recommended! TOUR GUIDE RESPONSE: Thank you Michael! I had a great time with you and your friends and I am so glad to here that I helped you enjoying Florence!!! Giovanna was a wonderful guide thru the city of Florence. Her knowledge, flexibility and enthusiasm provided us a great experience and we look forward to returning to Florence and touring with Giovanna again. TOUR GUIDE RESPONSE: Thank you Gary, it was a very pleasant walk for me too! I will be more than happy to tour again with you and your wife! Giovanna was exceptional- fun, informative, and engaging. We saw so much more in the few hours we had with her that we ever would have seen with a cruise tourgroup. Her knowledge of art and architecture is admirable- her tour of the Uffizi gallery was phenomenal- we had other people just hanging out near us so they could listen to her. Using the private car from the cruise terminal was a little expensive, but well worth it in the time we saved vs using the bus. TOUR GUIDE RESPONSE: Thank you Ed&Gail. Great time spent together! This was our second time Giovanna, after we go together in 2017. She is easy going and passionate and is willing to customize to meet your needs. Felt more like we were hanging out with a friend. Santa Croce and the cloisters were amazing as expected! TOUR GUIDE RESPONSE: It's been a pleasure to spend time with you and Julia and your friend Emily. Hope to see you again in Florence! Wonderful tour. Giovanna was a wealth of knowledge on old and new. Would highly recommend. Giovanna was the PERFECT guide! She is so knowledgeable and we loved hearing the history of this beautiful city while she took us from place to place. She was willing to modify the tour based on our preferences- which is one of the reasons we love tours by locals. The driver was right on time picking us up from the ship and the van was new and comfortable- with great air conditioning! Thank you for a wonderful day in Florence. Wish we had more time with this fantastic guide! Grazie! TOUR GUIDE RESPONSE: Thank you very much for your kind words! It was a pleasure to guide you in Florence! We loved our time with Giovanna, who catered the tour to our wish. 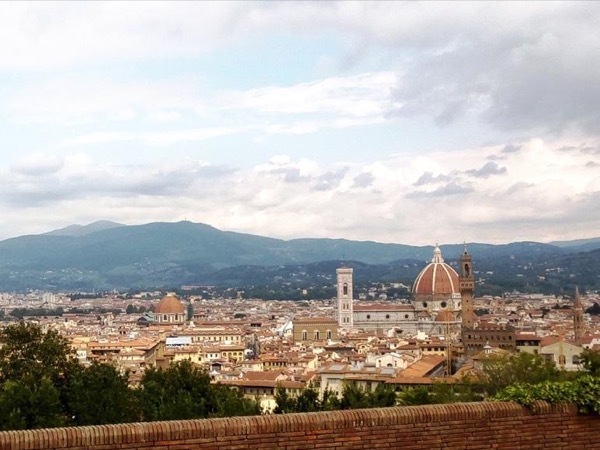 We've been to Florence several times and we wanted something a bit more hidden and foodie. Giovanna delivered and our time at the Mercato was divine. She is knowledgable and passionate about Florence and extremely flexible in customizing a tour. Highly recommend and look forward to meeting again! Giovanna is a wonderful guide. She arranged for us to visit Pisa, purchased our timed tickets to climb to the top of the tower in advance and also arranged for skip the line tickets to see The David in Florence. Giovanna is very friendly and extremely knowledgeable. Her love for Florence is evident at every turn. She was terrific with our kids and made sure they stayed engaged and were having fun. We highly recommend Giovanna to anyone visiting Florence. She is an amazing guide and a fabulous person! TOUR GUIDE RESPONSE: Amy! Thanks for your kind words! it has been a pleasure meeting you and your beautiful family! Wonderful and k knowledgeable guide. Would definnately recomment her. TOUR GUIDE RESPONSE: Thank you very much Carol! It was a great time here in Florence with you and your beautiful family!! Giovanna is a very knowledgeable tour guide, particularly in her area of expertise, archaeology. We enjoyed our tour very much. We would recommend Giovanna. Amazing, really knowledgable and passionate about the history and culture of florence, the art, the sculptures, the history of the families that shaped the area, with amazing interest we were told in detail the history of the city and the architecture, all while being filled with details that really made the tour an incredible experience, well done, so great to have someone with such passion and knowledge showing us Firenze. What a wonderful tour! Giovanna had a wonderful grasp of the historical background of the city - and brought so many of the sites to life as a result. She met us at our hotel as promised and provided terrific background of the city. She exceeded our agreed upon time by thirty minutes (we asked a lot of questions) without complaint. if possible, do this tour "first thing" and then you can return to the sites and museums that interest you after. Thank you Giovanna! TOUR GUIDE RESPONSE: Dear Mike and Laura, it has been such a great time with you. I love curious people and you were so involved in the tour that I felt honored to be your guide! I wish you all the best in your life! Arrivederci! TOUR GUIDE RESPONSE: Thank you so much for you review Mr Stacey. It was a pleasure to have met you ad you wife here in Florence. Hope to see you again soon! Giovanna was contagiously excited about her topic, extremely personable and tailored the tour to our interests. I highly recommend her.